When you need access to a firearm fast, one of the easiest locations to store your gun safe is under the bed. Even long guns can be stored under the bed with the right kind of safe. In order to find the right make and model that can meet your needs; these under the bed gun safe reviews are designed to help pick out the features and advantages that you’re going to need. That way you can have the ultimate solution for the hidden gun safe that you want today. Sometimes referred to as a “defense vault” or “above floor safe,” an under the bed gun safe can either slide underneath your bed or actually replace your box springs. When there’s a strange sound that wakes you up, you don’t have to go anywhere for a defensive firearm. It’s right there when you choose from the products below. The one problem that many people have with gun safes is that they aren’t necessarily discreet. When you see a gun cabinet in someone’s basement, then you know that they’re storing firearms of some sort inside of it, right? With the right design, an under the bed gun safe will give you the discretion you want with the access you need. Using the under the bed gun safe reviews, you’ll also be able to pick out these additional advantages that can meet your specific needs. Flexibility. Many defense vaults can be accessed from either side of the bed. This allows righties and lefties the ability to grab a gun and go when there is a need to defend oneself or one’s family. Accessibility. If you have a vault that takes the place of your box springs, you still have easy access to whatever firearms you need to store. Because it’s in your bedroom, you won’t have to race whatever intruder might be in your home to make it to your gun cabinet first. Options. Under the bed gun safes come with the same locking options you’ve come to expect from other designs. This includes biometric locks based on your fingerprints so you won’t have to worry about unauthorized access to your firearms. 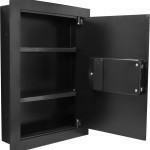 As an added benefit, the best gun safes in this category are heavy and difficult to handle once they are installed. Many thieves who are targeting your firearms will simply steal the gun safe and crack it open on their time. When the gun safe is the size of your box springs and weighs a couple hundred pounds that becomes virtually impossible to do. Even if they can get it out of your home, there’s a good chance they won’t be able to take it anywhere. After all – how many vehicles can haul a defense vault that’s the size of a king sized bed? The first question to ask yourself is this: do you want to have a gun safe that needs to be mounted to your floor? If so, then what you’ll want to look for is a defense vault that works with your firearms and rifles. If not, then you’ll want to look for a bed-based gun safe that replaces one component of your sleeping apparatus – usually your box springs. Next you’ll want to look at the type of lock that you feel is necessary for your gun safe. Keypad locks are common for this type of safe, but you’ll want to find an illuminated lock in this instance since most intrusions that require access to your safe will occur at night. Biometrics is a good investment in this category as well. How the guns will be accessed is also important to look at. Many defense vaults come equipped with a slide-out tray that has been given some light padding. You might have pre-cut storage areas for specific firearms. Some defense vaults require mounting the firearm to properly store it. To figure out which product will best meet your demands, the under the bed gun safe reviews found here will help you discover the features you want, the advantages you need, and the price you can afford. Mounting this type of safe is the most common issue homeowners face. To properly mount a defense vault to the floor, you’ll need to affix it to the studs that support your subflooring. This can be somewhat problematic, so some homeowners just slide their safe under the bed and call it good – but that makes their firearms easier to access. You may wish to speak with a trusted contractor about installing this safe. Because many models have an electronic lock, it can be difficult to remember your code in the dead of night when you’re awakened by a strange noise. Since writing down your code defeats the purpose of having it and finding your keys can be difficult, consider upgrading to biometrics. What Are the Prices of Under the Bed Safes? Most under the bed safes or defense vaults can be found in the $300-$400 price range. You’ll find the gun safes that take the place of box springs tend to be about 25% higher in cost, but they also provide more overall capacity for firearm storage. Many models are made with 14 gauge steel, but be wary of certain brands that charge premium prices for lower quality steel in this particular gun safe category. This under the bed gun safe is compact, secure, and contains a biometric lock that can hold up to 30 fingerprints so you can authorize whomever you wish. It has enough storage space for one large firearm or a couple smaller ones and there are pre-drilled holes for mounting to a wall, your bed frame, a shelf, or your preferred location. Two bolts secure the door and internal hinges and an overhead flange limit the ability to pry open this safe. If you need a fast way to access a defensive firearm in the middle of the night, we can think of an easier method than to have this safe close to where you sleep. This small under the bed gun safe might just be the best option for your 1911. It is designed for an almost customized fit with internal padding to help keep the firearm safe while being stored or transported. The external shell is composed with 14 gauge steel and it can easily slip into a drawer. A handle allows for easy transport. You can also choose to mount this gun safe either vertically or horizontally. A push button lock is what gives you access. Semi-automatics and some revolvers also work with this gun safe. This keyless entry system is one of the best in the industry today. Many gun safes only give you four combination buttons from which to choose, but this manufacturer gives you 5 for some added combination variation. The steel clamshell design is surprisingly sturdy. Just beware that the locking mechanism does take up some additional space, so this gun safe works best with firearms that have a slim profile. Otherwise you’ll be storing your gun in the corner of the safe and that might lead to scratching. When it comes to under the bed gun safes, a defense vault provides you with an added level of security. Out of all the defense vaults that are available right now, the heavy gauge steel and solid electronic lock on this model will give you fast access to your firearms, yet store them securely. This is the solution to consider when you want to keep loaded firearms away from curious fingers. You can accommodate rifles, shotguns, and handguns all in one slide out drawer. This under the bed gun safe understands that looks can be an effective deterrent just as well as function. It looks like a biometric safe, but in reality it is a simple keyless entry system. It weighs just 5 pounds, yet the exterior shell is formed from 16 gauge steel. A foam lining has been included within the interior of the safe. A security cable has been included if you want to carry a firearm in your vehicle with a concealed carry permit and there’s enough room for you to carry 2-3 firearms in this safe depending on their size. It even notifies you if someone has attempted to access the contents of the safe while you’ve been away. The best under the gun safe reviews will help you find the right solution to keep you and your family safe. Thieves tend to strike when a home seems like it would be an easy mark. By investing into one of these safes, not only will you be able to secure your firearms from unauthorized use, but you will still have them at the ready should the need arise. This is the investment to make this year.